These instructions are for those of you that, for whatever reasons, want to clean your own bear or deer skull or any other bones. It may be for a school project, it may be because you want to save some money or it may be just for fun. For that last group, let me say it is NOT fun, it is smelly, hot and more work than you think. I no longer clean skulls myself, I send my skull cleaning jobs to a specialist. NOTE :Potential record book skulls should NOT be cleaned by this method. They may be damaged or shrink. Record book skulls should be cleaned by professionals ONLY - using beetles or by maceration . I have heard all the "old timer" ways to clean a skull - stake it on an ant hill, toss it on the garage roof, wedge it in the fork of a tree and so on. And given enough time, 5 years +, many of these methods will work to a degree. The fact is that ants will only eat the meat fresh, maggots only eat softened, spoiled meat and certain beetle larva will eventually clean up the dried tissue. But if you want a WHITE, clean skull in a reasonable amount of time, you need to either pay someone who knows what they are doing or follow these directions. Let me add a disclaimer right here. These instructions are provided at your own risk, no promise is made or implied. If you are the type of person that refuses to read & follow instructions, if you lack common sense around fire, chemicals & sharp objects, if you are prone to sue somebody else for the stupid things you do, then leave this web page & pay someone to clean your skull. That being said, let's go. A heat source, i.e. a stove, outdoor grill or smoker (gas is easier to control), gas weed torch, etc. Allow the skull to boil for 5 minutes or so, use the tongs and lift the skull out of the water. If the meat has started to peel away from the bone, then use the knife to scrape & the wire brush & start cleaning. When you have removed all the meat that will come off easily, put it back in the water and allow it to boil some more. Repeat this process as needed. Use the wires & picks to clean out ALL the holes, veins & tissue in the nooks & crannies. Pay close attention to the lower jaw, the brain cavity & the nasal passages. It is important to remove all tissue from the skull or it will begin to smell. HOWEVER, in order to keep the skull from starting to fall apart, you want to boil it for the shortest time & at the lowest heat possible. Some teeth may become loose or come out. I recommend you remove the teeth, clean the base or root & and lay them out to dry in their proper order (or position in the mouth), much like a dental chart. When you have removed all the tissue you can, leave the skull someplace outside where it is out of direct sun, like a garage or an old ice chest. You want the skull to stay moist and you want flies to be able to get to it. If you have missed any organic tissue, the flies will find it and in a day or so, maggots will begin feeding on what you missed. It may begin to smell, but this is OK - they will soften the remaining tissue in places you may not be able to reach. After a few days, boil the skull again in clean water with washing soda. This should remove any maggots and remaining tissue. Use the air compressor & a blow gun nozzle to flush out the brain cavity & the veins. Scrub the skull with soap & water and allow it to air dry. enough white gas (Coleman lantern fuel) to submerge the bones. Other solvents may also work such as - dry cleaning solvent, acetone or auto parts cleaning solvent. Follow all manufactures precautions when using these products - most are highly flammable. Completely cover the bones (except the teeth) & allow them to soak overnight - 12 hours or so. Then remove them and let then air dry in the sun. Clean the teeth with the solvent one at a time using an old tooth brush. Place them on a clean paper towel in their proper order. Submerge the horns on goats, etc. for 12 hours or so, then remove and allow to dry. After a few days, or when the skull is thoroughly dry, glue the teeth back into position using a small amount of super glue on each tooth. Allow the glue to completely dry before beginning the bleaching process. Again, put on your safety equipment, use your common sense and follow manufacturers safety precautions. In a plastic container, mix the about 1/2 cup of Hydrogen peroxide with the Mag. Carbonate until a thick paste is formed. Brush it all over the skull. I use a wire to hang the skull to dry. If you can, hang it in the sun. Place something under the bones to catch any drips. On antlered skulls - DO NOT get it on the rack. When the skull has dried, put on your dust respirator, and brush the flakes off the skull. The powder can be saved & re-used. Rinse the remaining powder off under running water and place it in the sun to dry again. Now you can put on a finish if you want. Now is the time to attach horns back to the skull on goats, sheep & antelope. I cut off at least half of the core (the part that goes up into the horn), then wash both the inside of the horn & the core with acetone. Dry both parts. I like to use a 2- part liquid foam to secure the horns to the skull. You can purchase this at most hobby shops. Test fit the horn and when it is in the proper placement, drill a small hole thru the horn and core. Find a wire or small nail that will fit snuggly in the hole, then remove the core. Mix only enough foam to do one horn at a time. Pour it into the horn, quickly roll it around to coat the inside, then slide the horn onto the remaining core. Slip the wire thru the pre-drilled hole and allow the foam to finish expanding. When it has not quite fully hardened, cut off any excess foam and use acetone to clean any foam off the horn. Repeat for the other horn. 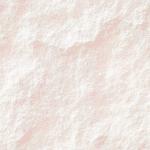 Another method that also works and is a little less expensive is Bondo Glass. This is Bondo brand body putty with fiberglass mixed in and is very strong with good adhesion. Follow the instructions above, except use a small putty knife or stick to coat the inside of the core with the bondo. While it is not necessary to put any finish on the skull, it is recommended if it will be handled. Bone is porous and if handled enough, will absorb grease & oils from hands. I spray mine with a non yellowing clear satin finish like Krylon or Envirotex. You can get these at an art supply house and most paint or hardware stores. Floor wax is also used by some, but I have not tried it, so you're on your own if you want to use it. THAT'S IT !! Your done. Now don't you wish you had just paid the money and had somebody else do it? (Want to check the price? - CLICK HERE) Because some of these materials are hard to find or only available in bulk, I have assembled a kit with enough materials to clean several skulls. Each kit contains instructions & enough washing soda, peroxide, & mag. 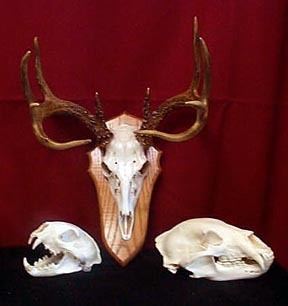 carbonate to do 3 average (bear or deer size) skulls. You will need to provide all safety equipment, degreasing solvent and tools. For those of you that are interested in purchasing one of these kits - please send me an e-mail with the word "skull cleaning kit": in the subject line. After doing some research, the Clairoxide 40 mentioned above is not a 40% peroxide solution, but is the strongest over the counter peroxide you can buy. This is the exact same peroxide I have used in my shop for years with good results. It is still almost 3 times as strong as the stuff you can buy at the grocery store. If you have done a good job of cleaning the skull, it will whiten them just fine. I have found 2 sources for stronger peroxide (35%), but you will have to order it directly from the company. I am no longer selling the skull cleaning kits, but you can order one from the companies below.